Private Bass Guitar tutoring lessons Antioch, TN. Check out some of our most popular teachers near Antioch, TN including Nashville, Mount Juliet, Brentwood, Franklin and Murfreesboro. The bass guitar (also called electric bass, or simply bass; /ˈbeɪs/) is a stringed instrument played primarily with the fingers or thumb, by plucking, slapping, popping, tapping, thumping, or picking with a plectrum, often known as a pick. As a multi instrumentalist and producer, I often find myself playing bass on recordings. I can help with technique and theory associated with the electric bass for most music genres. I learned the bass guitar when I began listening to rock music. I would often double on bass and sax. I have a Hohner, a Stingray V and a DP Custom 5 string and plenty of stage experience. I've played sax for 20 years, bass for 15, and taught many students and performed with a variety of acts. I studied music and education at Kent State University, obtaining a bachelor's degree in 2006. I can help you apply what you learn in your performance, or get you to a level that you will be comfortable performing with other musicians. I'm patient and easy to get along with. When dealing with younger students I will supplement my teaching with whatever curriculum they are already studying. Each lesson will cover technique, learning pieces, ear training and improv. I deal with each student on an individual basis. Large and small condensor mics, ribbon mic, multi-track digital recorder. f choice or current material audio or written. Ear training, Sax upper register development (tenor) tone development, improv. Hayes is super helpful and encouraging. I walked in feeling a little intimidated because I haven't really played in 30 years. He made me feel very comfortable and motivated. Good first lesson. As a middle-aged guy who has played drums all my life, I wanted to add the bass guitar to my repertoire. Hayes is exactly the right guy and was able to show me how to get off to a quick start and then be able to add to my skills as I keep playing. I would recommend him highly! Learn the music you want to learn! Any style, any genre!! With a Bachelor's Degree from Morehead State University and three years teaching experience I can offer you the most fulfilling learning experience! Beginner, Intermediate and Advanced players welcome! 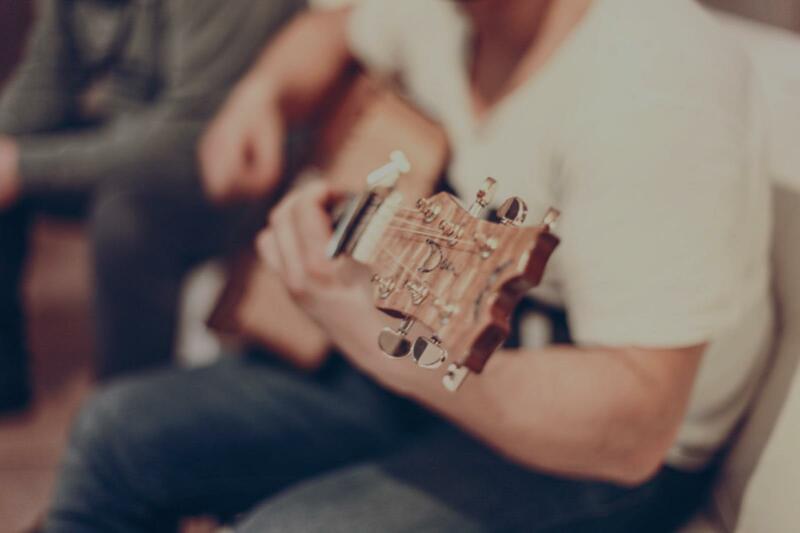 Lessons for Guitar, Banjo, Mandolin, Ukulele, or Electric Bass! David is punctual, very patient, and makes lessons fun as well as challenging which is essential for progress. David is on time, well prepared, flexible with scheduling and he tailors his lessons to his student’s wants and needs. Our 12 year old grandson enjoys his banjo lessons with David. I can take you through the basics of learning to play the bass guitar, and into the intermediate level. For advanced technique, I can point you in the right direction. I have a good 4 years of experience using my band performance guitar abilities, and knowledge of music theory/production towards bass technique and practice. I understand the role a bass should play in most pop/funk/soul/rock/reggae/alternative/blues settings, and I work with students on right hand finger technique, holding rhythm and staying in the pocket, theory and scales, and learning songs is a great benchmark to cover all of those essentials. As a gigging musician in Nashville, I know how vital it is for a bass player to have great feel. I strive in my bass lessons to give students a foundation of technical skills and music theory, but to also encourage the growth of a student's ear in order to turn them into a functional musician that can play for enjoyment or have the knowledge to step into band or ensemble situations and fit into the groove. Bass players are always in demand. Zelda offers basic beginner bass lessons to give you a head start for bandwork. Many popular styles covered - from pop, rock, country, blues, Americana, R &B, singer songwriter and more. Learn the basics for keeping rhythm and time. And as a bonus Zelda can also train bass players to sing and harmonize which is a valuable skill for bass players giving them the edge over other bass player who just play bass and don't sing. Can't find a teacher in Antioch, TN?